Kiev on 12 and 13 November 2016. Both B2B and B2C. representatives of all Ukrainian vape – culture: from manufacturers Vape devices and e-liquids, to the people who have linked their lives with vaping and simply those who are interested. 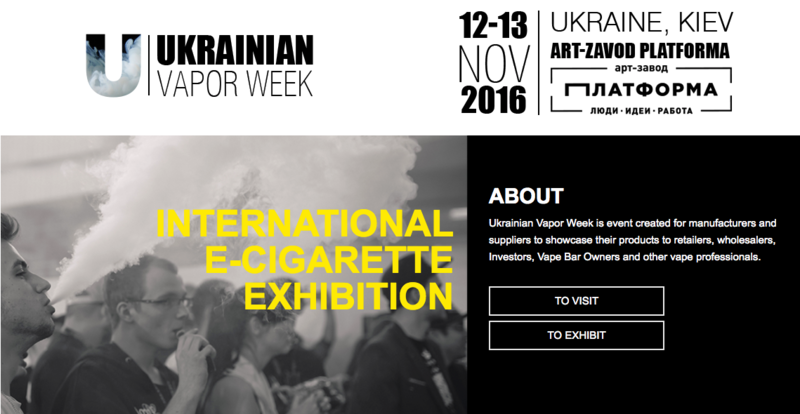 As organizers of the event say that Ukrainian Vapor Week – will get new format, which previously never take place in such scale in Ukraine, since all the events will take place in a thick and fragrant steam. In particular, in the framework of Ukrainian Vapor Week will be possible to listen sets from the best Dj&#39;s from DJ FM radio station, to see new Vape devices, participate in master classes, as well as enjoy the unique Vape tricks show and Cloud contest – the competition for real vepers and all this under the best music from our DJ&#39;s.
The venue of the Ukrainian Vapor Week selected the most popular platform for today&#39;s Event of this magnitude – Art Zavod Platform (1 Belomorska str. ).